Making the decision to have your yard professionally installed by a landscaping company in Fort Collins is the best decision you can make. Our experts know all the details about which plants will work best for your specific space and water conservation. Spring is coming to a close and you want to make sure to get things planted in time for them to thrive all summer long. Spring is the best time to plant in many parts of North America. 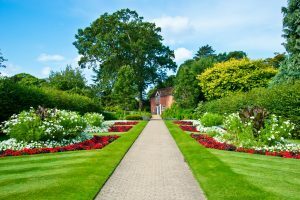 The days are typically cooler and bring the benefit of additional precipitation which means landscaping will not require more irrigation. Most plants can be planted when the ground is not frozen however there are some exceptions. Spring flowering bulbs should be planted in the fall. Installing large trees and shrubs should be planted before the rest of the landscaping is installed. Turf areas are the most water intensive part of the landscape. Good site preparation and installation is essential to keeping areas water wise. Turf can be installed as seed, plugs, or sod depending on the variety. If you will be using an automatic sprinkler system it should be installed prior to planting. Each zone should be operated any repairs needed should be taken care of. when using sod, the area should be thoroughly prepared before having the sod delivered. It will reduce the root damage that can occur from drying out. Sod should be watered immediately after installation and will require frequent watering until the roots establish. The key to water conservation is hiring a reputable company to take the guess work out of your installation.